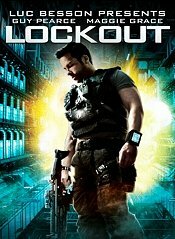 set in the near future, Lockout follows a falsely convicted ex-government agent, whose one chance at obtaining freedom lies in the dangerous mission of rescuing the President's daughter from rioting convicts at an outer space maximum-security prison. It seemed hopeless that Snow and Emilie were going to survive, so I was on the edge of my seat the whole time. Guy Pearce (Snow) is hilarious and badass and not too bad looking....like usual. The ending was pretty good and I approve. The true big baddie was a twist and surprised me. Emilie was perfect and as you all know I hate annoying characters; she was pretty, rich, smart, bold, brave, a saint, and just loved by everyone. Gah. A couple loose ends that annoyed me. Wish I could say more...but I don't want to give away any spoilers. It was an okay movie. I loved the setting and the idea behind a prison for all the dangerous criminals is an awesome one. The acting and screenwriting were good, even though Emilie annoyed me to no end. Sighs. One flaw is all I ask...I hate perfect characters. Anyways...I would recommend this to those that love sci-fi movies with action and a small flake of romance. In the end I shall grant this....errrrr....3 stars. did you hire someone to do it for you? Plz answer back as I'm looking to create my own blog and would like to know where u got this from. Yeah. It was a random movie we picked.